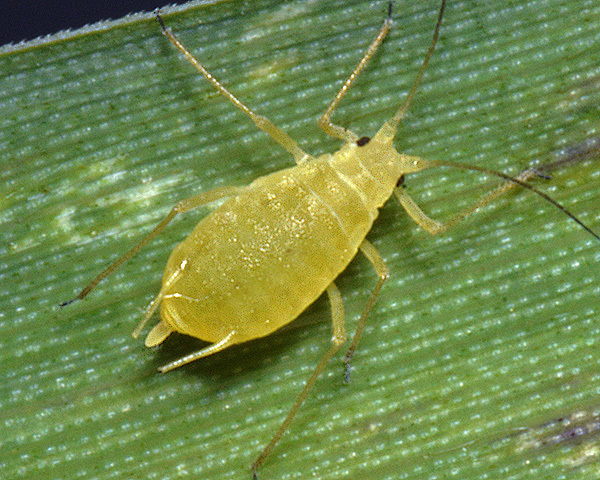 The body colour of adult apterae of Metopolophium albidum varies from pale straw-yellow (see first picture below) to pale yellowish green. The adult has no green spinal stripe (cf. Metopolophium dirhodum and Metopolophium fasciatum which both have a green spinal stripe), but sometimes has green spots at the bases of the siphunculi. The antennae become progressively darker from the base to the apex (cf. Metopolophium dirhodum which has the apices of antennal segments darker than the bases of the succeeding segments). 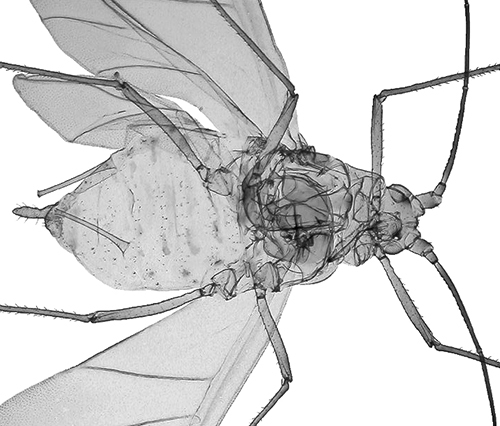 The terminal process is entirely dark and the base of antennal segment VI is 1.20-1.62 times longer than the second hind tarsal segment (HTII). The siphunculi are about 1.7 times the length of the cauda and 0.25-0.36 times the length of the hind tibia. The body length of adult Metopolophium albidum apterae is 1.9-2.7 mm. 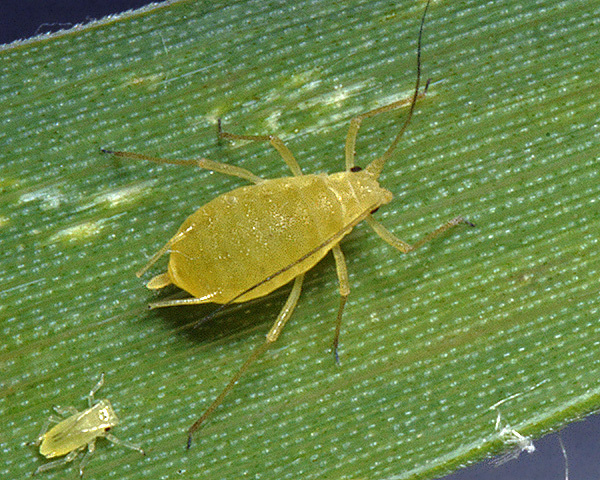 Metopolophium albidum alatae have a pale greenish yellow abdomen, a brownish orange head and a pale greenish yellow abdomen. The marginal and intersegmental sclerites are pale and there are sometimes faint cross bands. Immatures are a shiny greenish-yellow. The clarified slide mounts below are of adult viviparous female Metopolophium albidum: wingless, and winged. Metopolophium albidum feeds year-round on false oat grass (Arrhenatherum elatius). 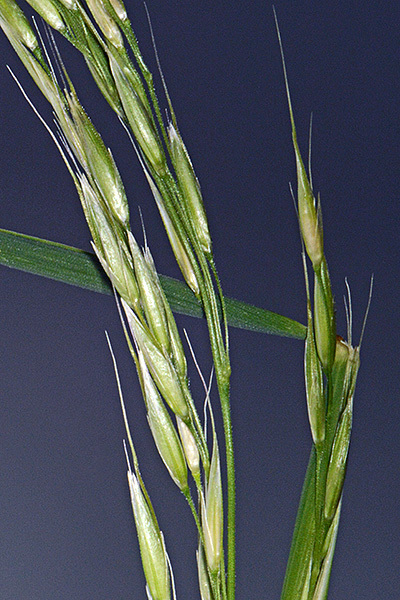 It has been recorded from a few other grass species including cocksfoot grass (Dactylis glomerata), wood bluegrass (Poa nemoralis) and possibly Agrostis or Bromus species. On false oat grass the feeding damage is characteristic, with red and yellow streaky discolouration of the grass blades (see second picture above). Sexual forms have been found in the Netherlands and fundatrices in Britain, but parthenogenetic overwintering is also common. Although Metopolophium albidum is most likely to be found on the leaves of this grass, it will feed on other meadow grasses during the summer months. 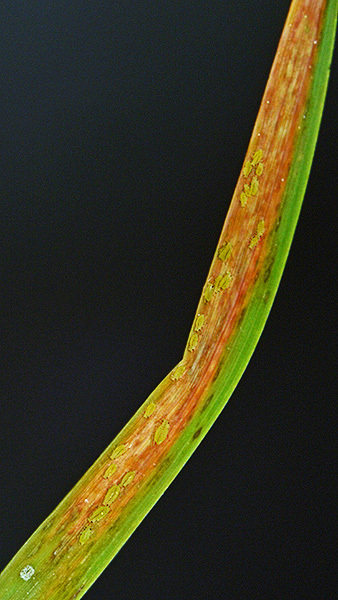 Metopolophium albidum colonies are most easily found by searching for grass blades with the characteristic red and yellow streaky discolouration (see second picture below). The colour of Metopolophium albidum is quite variable, and we have found both green and yellow forms of the adult aptera (see below). 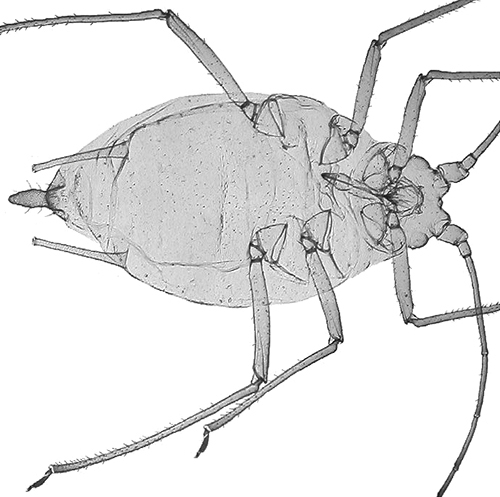 Stroyan (1950) first recorded Metopolophium albidum as a member of the British aphid fauna. He noted that it was a widespread and abundant throughout the eastern and southern counties of Britain, and thought that Metopolophium albidum probably occurred in plenty wherever its host was common. Moreover it caused much damage to meadow grasses. Despite its abundance in Stroyan's time, we have not found this to be a common aphid. Over the past ten years in southern England we have only found Metopolophium albidum on one occasion - in a Hampshire village. 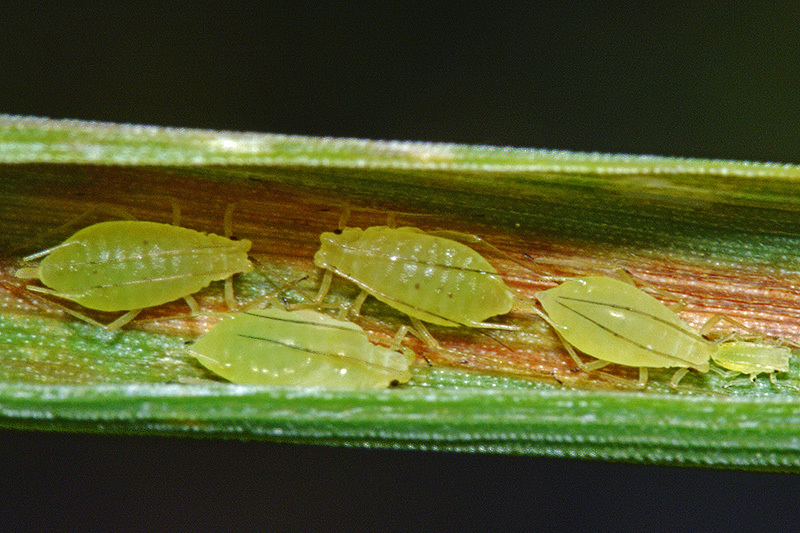 Similarly in a three year study of grassland aphids, Dransfield (1975) did not find this species in old pasture grassland, although admittedly false oat grass was only a very minor component of this grassland. Like other species of the genus, Metopolophium albidum is heavily attacked by hymenopterous parasitoids when common. Metopolophium albidum has been recorded from 1 Arrhenatherum species (Arrhenatherum elatius). 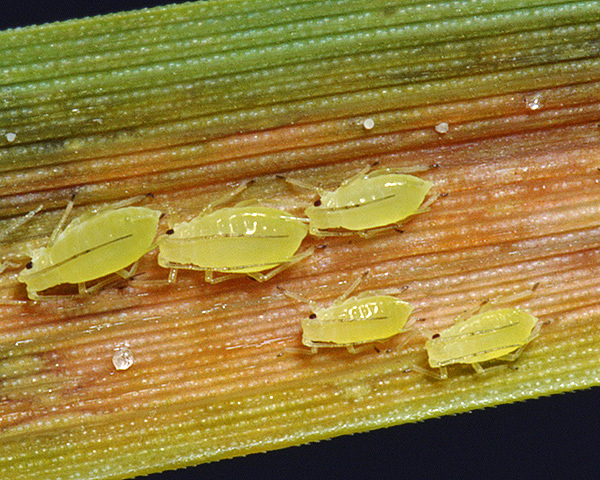 Blackman & Eastop list 20 species of aphid as feeding on false oat grass (Arrhenatherum elatius) worldwide, and provide formal identification keys.